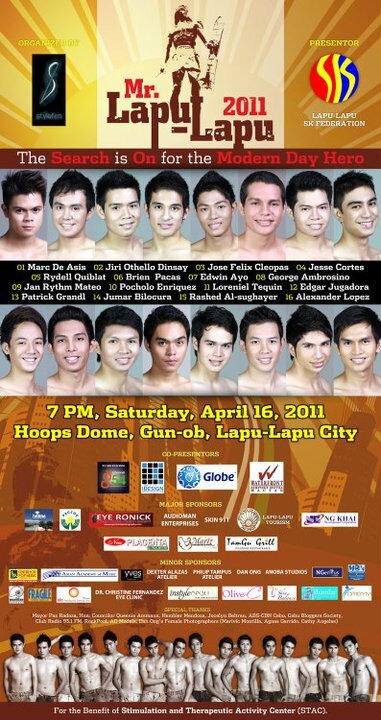 Mr. Cebu 1st Runner-Up, Mr.Jumar Andrew Bilocura is throned as the first filipino modern hero in Mr. Lapu-lapu 2011 during its warriors and pageant night on April 16, 2011 at Hoops Dome, Barangay Gun-ob Lapu-lapu City. FC would like to extend a congratulations to all the person behind the pageant, from the staff and other crew. Furthermore, to the brainchild of the event's concept, Mr. Dexter Alazas who is also the creative director of Stylefirm, Ms Queenie Amman, the chairman and so with the SK Federation represented by its President, Ms. Frances Nicole Balao, who actually created events for Mr. Lapu-lapu like barangay immersion, feeding program, clean up drive fundraising, and the Lapu-lapu challlenge ala Amazing race. Kudos to all! Be have a great Mr. Lapu-lapu 2012 next year!